Military enterprisers and contractors in Ireland found it easy to practise their trade because the English lords deputy and provincial governors made life difficult for idled soldiers. The death of Lord Mountjoy in 1606 deprived Tyrone and the other Irish earls and chieftains of a sympathetic ear in the Irish government. The enfranchisement of the inhabitants of Ulster as English subjects in 1605 effectively deprived the Irish lords and chieftains in that province of their authority and contributed to the flight of the earls in 1606. The president of the province of Munster, Sir George Carew, declared his intention 'to hunt' the idled soldiers, and he proposed employing Catholic prisoners of war to fight the remaining rebels so that they might consume one another. Any who remained after this sweep through the woods and bogs could be dispatched to the Indies, Virginia or the Low Countries, where 'three parts of four were likely never to return'. The English Privy Council discouraged sending them to the States' Army, but did not care if they went to the Spanish Army of Flanders. The further away the better was the rule that English officials followed, and voyages to the Indies were ideal since tropical conditions exacted such a high toll. Recruiting policies throughout the Three Kingdoms appear to have been driven by official concerns for domestic stability regardless of the impact on foreign relations. Thus, contractors for the Spanish Army of Flanders were allowed to recruit in Ireland even though this was prejudicial to Dutch interests. Recruiting for the Spanish army was briefly prohibited following the discovery of the Gunpowder Plot of 1605, but by 1606 at least four Spanish recruiting parties were busy in Ireland because Dublin Castle assigned a higher priority to cleansing Ireland of swordsmen. James I also encouraged English Catholics to serve in the Spanish army, despite the fact that this facilitated communications of Catholic recusants in England with their friends and kinsmen in Flanders, permitted young men from English Catholic families to be educated overseas and made it easier for priests, disguised as soldiers, to return home. While it was lawful for subjects of the king of England to serve in foreign armies, it was made a felony to leave the country for that purpose without first having sworn an oath not to be reconciled to the pope and not to be a party to any conspiracy or plot against the king. For their part the Spaniards never missed an opportunity to subvert the king's subjects. Thus, William Trumbull wrote to Sir Dudley Carleton from Brussels in 1619 that Archibald Campbell, seventh earl of Argyll, who was scorned at home, was 'caressed' by the Spaniards and given an annual pension of £1,500. The Irish earls and their gentlemen retainers who went to Flanders found a welcome from kinsmen who had already settled there and a government which was happy to educate-and indoctrinate-their sons. The number of men from the British Isles who volunteered, were recruited by military enterprisers and contractors or were impressed for service in the various armies of mainland Europe during the Thirty Years War was at least 55,000 and may have totalled as many as 80,000. The number of Englishmen was between 10,000 and 15,000; the total of the Irish probably exceeded 15,000; and the Scots, who appear to have been everywhere, certainly numbered at least 25,000, but could have been as numerous as 50,000. The dates of the Thirty Years War as usually given are, of course, arbitrary and merely represent the widening of a number of conflicts; nor did the Peace of Westphalia (1648) end the conflict between France and Spain, in whose armies substantial numbers of soldiers from Scotland and Ireland served. Perhaps as many as 20,000 Irish soldiers had already fought in the Spanish Army of Flanders between 1586 and 1611. Although only 4,000 Irish were serving in that army in 1623, one must remember that wastage rates of 50 per cent a year when armies were in the field were not unusual. As many as 25,000 Irishmen, assigned to seven regiments, probably served in the French army between 1635 and 1664. Twenty-five thousand soldiers from Scotland seems like a great many, since this would represent one-tenth of the adult male population of Scotland, yet there is good reason for thinking that such a figure is a low estimate. Twenty-five thousand soldiers from the British Isles served with the Swedish army during a three-year period between 1629 and 1631. The Swedish army at one time had thirteen Scottish regiments, each with an authorized strength of 1,008 men. 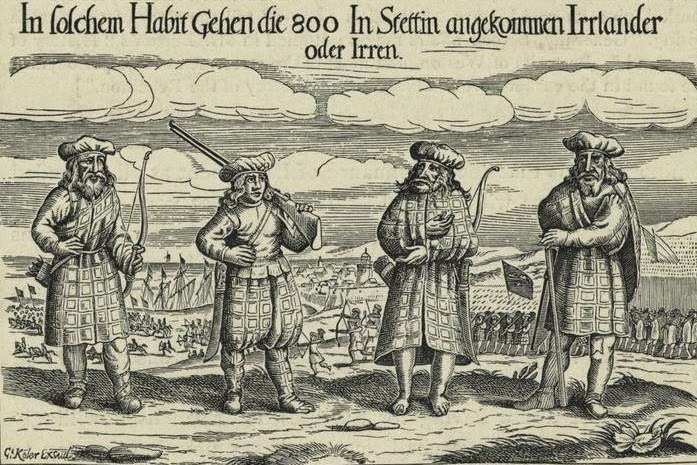 Donald Mackay, first Lord Reay, the busiest of all Scottish military enterprisers, alone recruited 10,000 Scots for the Swedish army between 1629 and the mid-1630s. The Danish army employed 10,000 to 12,000 Scots and English soldiers before its participation in the Thirty Years War collapsed. Because of poverty, as many as 100,000 Scots (10 per cent of the total population) emigrated from Scotland in the early seventeenth century, and Allan Macinnes estimates that half of them were soldiers.